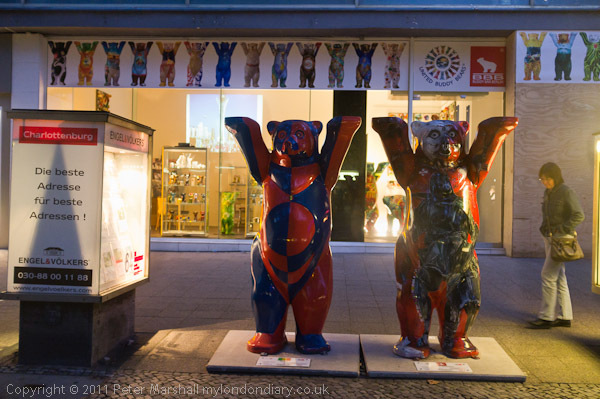 We’d seen the odd bear on our walks around Berlin, and I think at least one appears in my earlier posts, but on our last evening in Berlin we went to visit what seemed to be Bear Central, better known to the residents of the city as Ku’damm. Kurfürstendamm is a long street lined with the kind of shops I would never dream of going into, but I ddin’t have to worry as most of them were shut by the time we arrived. During the day it’s a Hell of consumerdom, but at night it was just a rather dull street where nothing much was happening, though there were just a few bars open. Back in the 1920s and 30s, this was the centre of Berlin’s nightlife, brought to an end by the Great Depression and the rise of Hitler and finally buried under a street full of broken glass on Kristallnacht, 9-10 November 1938. It was seeing photographs of this earlier in the day at the Topography of Terror museum on Niederkirchnerstrasse that had promnpted us to make our journey to see the street today. 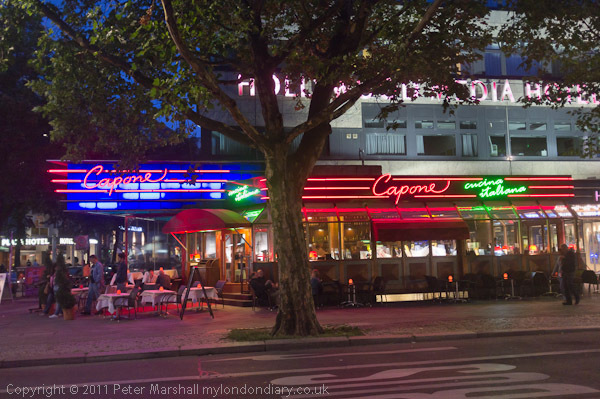 When much of the centre of Berlin was in East Germany after the war and particularly after the building of the wall, Ku’damm flourished as something of a showcase of the West, but with reunification, the nightlife shifted to the former eastern zone. 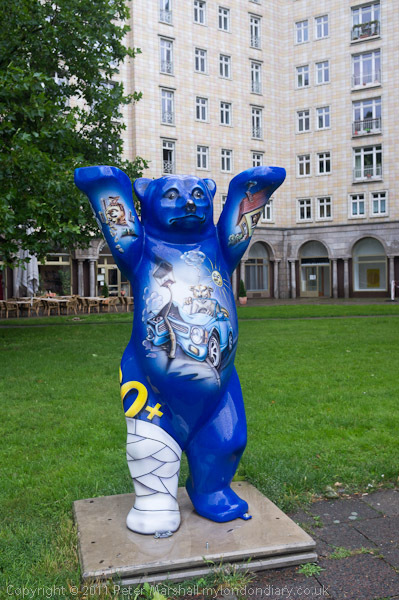 Apparently nobody knows why the bear became a symbol of the city of Berlin; it put in its first appearance in 1280, but it was really in the 19th century it bcame fully esablished as Berlin’s mascot. 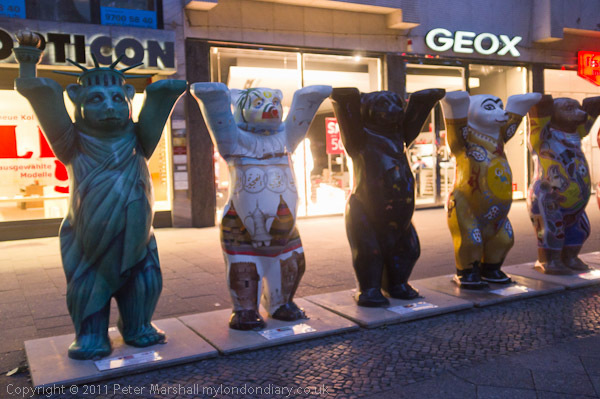 At the end of that century there were several hundred of varous shapes and sizes visible in the city and in 1920 Greater Berlin’s coat of arms incorporated a large standing bear similar to that later used by East and West Berlin and the united city since. 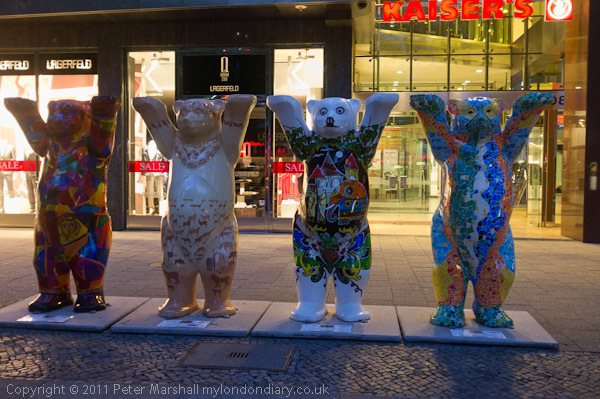 The bears we met on Ku’damm were the Buddy Bears, introduced by two Greman artists who, ionpsired by ‘cow parades’ in New York and Zurich put 350 bears on the streets of Berlin in 2001, which were later auctioned for charity. 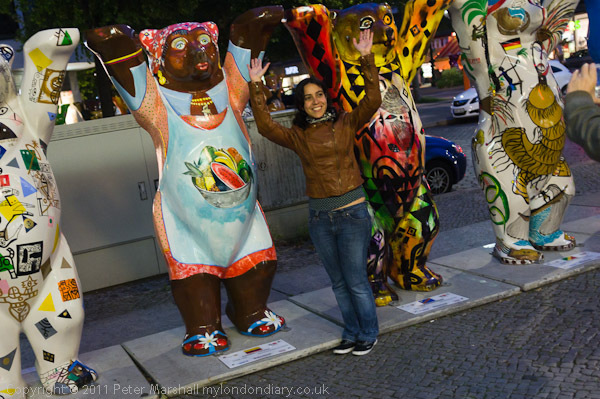 Next year came the United Buddy Bears, with its arms upstretched in a gesture of friendliness and optimism, standing in a circle around the Brandenburg Gate in 2002. Since then they have toured the world. 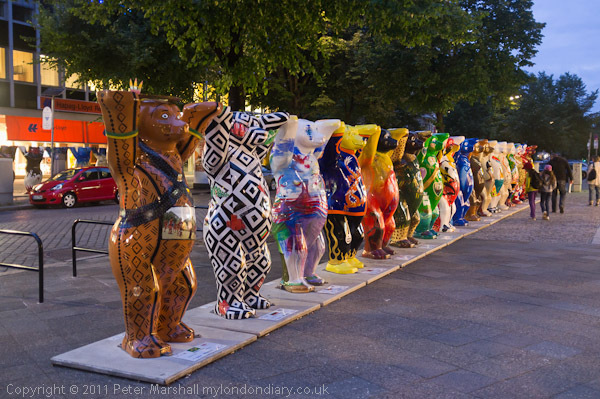 There are around 140 of them, each painted to represent one of the world’s countries, and in July 2011 they were back in Berlin for the summer before travelling on. 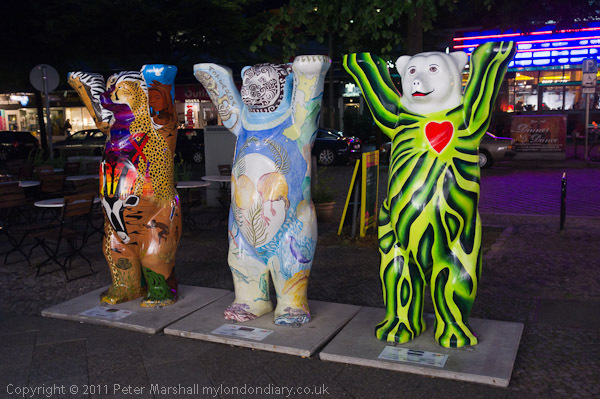 The bears still make money for charity, although the exhibitions are always free, as new bears are often produced for countries and those they replace auctioned off, and by October 2018, according to Wkikpedia, had made 2.3m euros for UNICEF and local organisations helping children in need. It was quite dark in the area where the bears were displayed, and my Fuji 100X had some difficulties in coping, and I didn’t like to go above ISO1600. Most were taken with the lens fairly wide open and a few don’t have quite enough depth of field for what I was trying to do. But the real problem was that they were mainly standing with their backs to well lit windows of the closed shops, with very little light on their faces. It was a situation where some fill-in light would have helped greatly and I had no flash or other light source with me. But those I’ve included here are just a few of those that I took which were reasonably succesfull. After a while, bears get a bit boring. 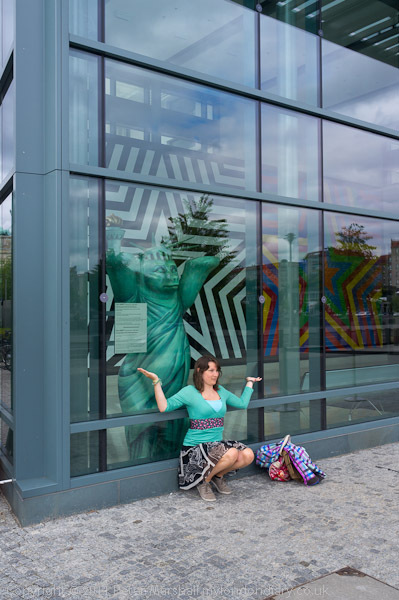 This was the last day of our stay in Berlin. The following morning we tidied up the flat and then took the bus to the airport for the flight back into Heathrow. I took a few pictures on the journey, but nothing of real interest. We got a good view of central London as we came into land, but the window wasn’t really clean enough for them to be useful. This entry was posted on Thursday, April 4th, 2019 at 09:14 am and is filed under My Own Work. You can follow any responses to this entry through the RSS 2.0 feed. You can leave a response, or trackback from your own site.